Genuine Brother® Accessory. 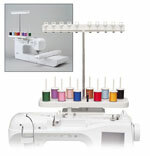 Thread stand conveniently holds up to 10 spools of thread of varying sizes. Thread locking system keeps loose ends in place when not in use. Each thread has its own thread guide to deliver thread smoothly to the machine. Snaps onto machine.